We provide a wide range of flowers to your door or workplace within 24 hours free of charge. 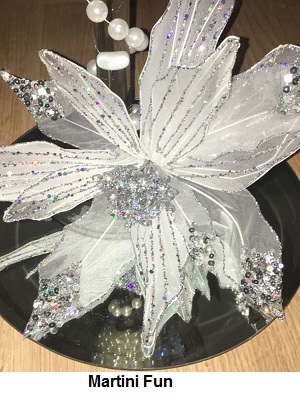 We were asked to make a centre piece for a New Years Eve party. Our client wanted something different and to give her guests the wow factor! The display was for a buffet table and therefore couldn’t take up too much room as there was plenty of food. It was also in a dark area so ideally needed to be bright. 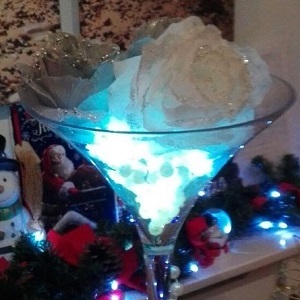 We designed a large Martini glass containing white and grey roses edged in glitter. 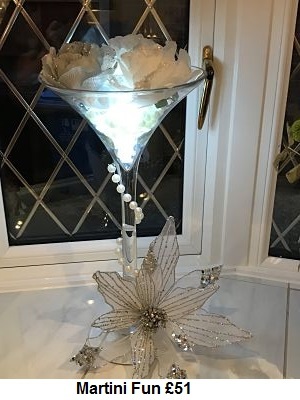 The glass was filled with pearls and battery operated lights to bring a sparkle of light to the table. 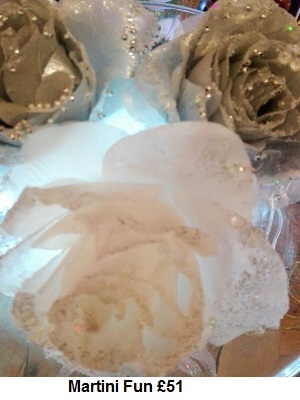 It also had a Crystal flower as a focal point on the bottom of the vase which was also edged in silver. Pearl beads wrapped around the stem finished off the design. Our client was delighted with the finished design. Her guests were talking about it all night and it was certainly the focal point of the evening. She loves it so much she is now using this on her dining table and is able to use this all year long.